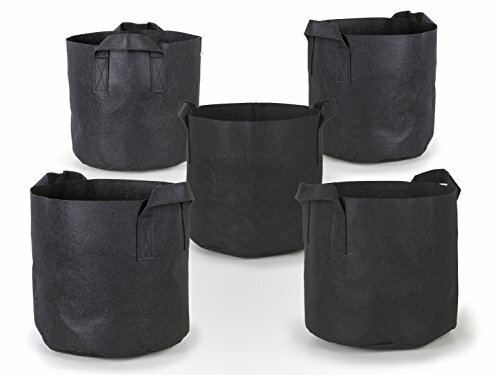 247Garden's 10-Gallon Aeration Fabric Pots combine the ease of use of a traditional nursery pot with the benefit of a breathable container. Keep the roots of your favorite plants cooler with more room to grow by planting in a breathable 247Garden Aeration Fabric Pot today! Made with 100% non-woven 260g landscape fabric, BPA-free and environmental-friendly felt. Sold in pack of 5. Key Benefits of 247Garden Aeration Containers: Stronger, healthier plants from start to finish. Improved overall root structure, producing more root tips. Elimination of root circling in pots Decreased risk of transplant shock. Better use of water and nutrients. Quicker growing time with most likely bigger yields. Our 10 gallon aeration fabric pot is good if you like to plant some nice big fruit tree like jujube, chinese oranges, and even good for dragon fruits! If you have any questions about this product by 247Garden, contact us by completing and submitting the form below. If you are looking for a specif part number, please include it with your message.